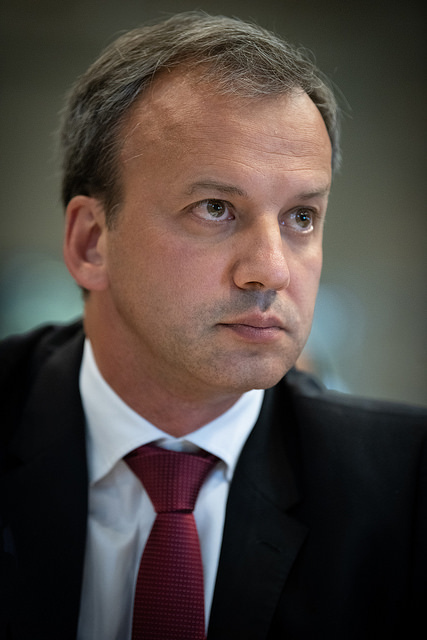 Arkady Dvorkovich has defeated Georgios Makropoulos 103:78 and will follow Kirsan Ilyumzhinov as the 7th President of the World Chess Federation (FIDE). 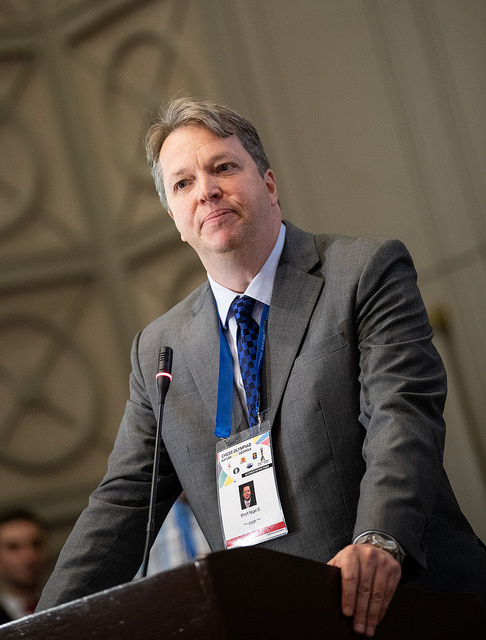 The vote at the FIDE Congress in the Sheraton Hotel in Batumi took a dramatic late turn as the 3rd candidate, Nigel Short, announced his withdrawal in his final speech to delegates. He endorsed Dvorkovich, who has pledged that, “FIDE should help federations, not the other way around,” and plans to back that up with a 20 million euro budget over the next four years. During Kirsan Ilyumzhinov’s 23-year reign, the former President of the Russian Republic of Kalmykia crushed all attempts to unseat him. With Makropoulos as his deputy his last three victories came over Bessel Kok in 2006 (96:54), Anatoly Karpov in 2010 (95:55) and Garry Kasparov in 2014 (110:61). In the end, though, it was US sanctions over ties to Syria that made Ilyumzhinov’s position untenable, and on the 29th June this year he signalled that he’d decided not to run for the position of FIDE President. The unstated threat was the same as always – vote for the winning side, or else! But who was winning? Well, the FIDE Forward campaign seemed to become less confident as the October 3rd vote approached, with the emphasis switching to methods other than the ballot box. On September 30th an attempt in front of the FIDE Ethics Commission to disqualify Dvorkovich from FIDE for 8 years – and hence win the election by default unless all his voters switched to Short – failed. That left a smooth path to today’s vote. We will cut immediately, or waive, fees paid to FIDE… FIDE should help federations, not the other way around. He pledged, “an annual budget of 3 million just to promote chess in developing countries”, and “a total FIDE budget of 5 million euros for a 4-year program, so that’s 20 million for 4 years”. He talked of “sustainable corporate sponsorship”, which may be within reach of a man who headed the organising committee of the FIFA World Cup in Russia, but even if that holy grail remained unattainable (links to Russia will make Western commercial sponsorship tougher to find) there’s no reason to doubt money would be available either from the Russian government or wealthy backers of his campaign. If you elect me as FIDE President I will put not 20 million dollars into the FIDE account today, but 40 million dollars yesterday! This is what I call Makro-economics. FIDE basically only has one main sponsor, Agon… or are we sponsoring Agon? It’s not clear! This is an organisation that has been in breach of the contract since Day 1. Yes, that’s half a million dollars, which was not paid when it was signed. In 2017 we heard from the Verification Committee that the expected income was 525,000 euros. In fact only 39,000 euros was collected. That’s equivalent to 6 times the Chess in Schools budget. I think we’ve got our priorities wrong. What happened with this dreadful failure of Agon last year? Well, they extended the contract to 2026, rather than cancelling it as any normal business would. To whose benefit is that? Certainly not FIDE’s. Agon events depress FIDE income. The prize fund for the Carlsen-Caruana match in London coming up soon is far lower than the Kasparov-Short match a quarter of a century ago, and that is not even counting inflation. That is how backward we have got. You have mismanagement on a gross scale. In the earlier session an intervention by Nigel Short led to the publication of a hitherto largely secret agreement between FIDE and Agon, dated 12th October 2017. Kirsan Ilyumzhinov’s US sanction issues are given as the reason for Agon’s failure to find sufficient sponsorship to meet its debts. Some of those debts are restructured, with Agon allowed to pay lower fees to FIDE and receive help with legal expenses. But more than this, more than the incompetence, mismanagement, lack of transparency and pitifully limited vision is the open culture of bullying. In this administration gens una sumus only applies to those who voted for the administration. Everyone else gets shafted. This mean-spirited vindictiveness has to stop. The rot in FIDE is so deep that it is obvious to anyone except those who benefit from the rampant cronyism that change must come. That is why in March this year I declared my candidacy for the FIDE President against Kirsan, who brought FIDE to the brink of oblivion, and Makropolous, who loyally supported him for two decades. Nevertheless, we have decided it’s in the best interests of me to withdraw, and I therefore endorse Arkady Dvorkovich! Arkady and I share many common goals. We are determined to bring reform and change to this organisation. While I know more about the chess world than he does, he undoubtedly, as the organiser of the hugely successful FIFA World Cup, knows more about sponsorship and administration than I do. ...but the timing was curious. Nigel could also have pulled out after a first ballot, but he wanted to avoid the scenario where he took too many votes away from Dvorkovich and made the race between the main candidates look closer than it was. There was still one speech to come, by Georgios Makropoulos, and it came in for much criticism. The downbeat, defensive message began with a complaint about Short’s comments, and in what followed the focus continued to be on the other campaigns. Georgios complained about the influence of Russian embassies, made accusations of bribery and suggested orders had come from the Russian government (“I feel sorry for Arkady, to get orders like this”), i.e. all the things Kirsan Ilyumzhinov, with assistance from Makropoulos, had been accused of in previous elections. It was hard to take the newfound emphasis on clean elections and “dignity above money” seriously. We’re not promising to change things, we’re already changing things. This is the difference! But the exact nature of positive changes that were helping chess as a whole, and not just making FIDE run a little more efficiently, remained unclear. There seemed to be two plausible explanations for the uninspired speech – either Makropoulos already knew he was going to lose, or he knew he was going to win, so it didn’t matter what he said. The suspense grew as the long process of calling each of the 182 delegates to vote commenced. When the result finally came it was clear: Dvorkovich had won with 103 votes to 78 for Makropoulos, with one invalid ballot (someone voted for both candidates). In the context of previous elections where the margin had always been 40+ votes it was “close”, but not close enough that there’s any prospect of the losing candidate challenging the result. Dvorkovich made a short speech in which he thanked his team and delegates, and added, “I would like to reassure you that FIDE is now my permanent job”. He vowed, “tonight we’ll have a small party, of course, but tomorrow we’ll start working”. 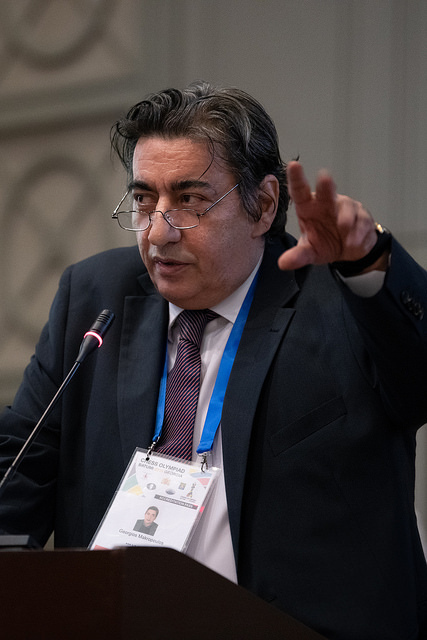 Let’s hope it’s the start of positive changes for chess, but for now we can all breathe a sigh of relief that the politics is over… and get back to the Chess Olympiad!